The Bhagavān, the Tathāgata Śākyamuni spoke those words; and at that, this discourse of his, with which accomplishment can be attained in one month, was complete. [Colophon:] The Mahāguru [Padmasambhava] concealed this on a stairway to heaven in Lhodrak (lho brag). Afterwards, Guru Chökyi Wangchuk (gu ru chos kyi dbang phyug) revealed this hidden treasure. 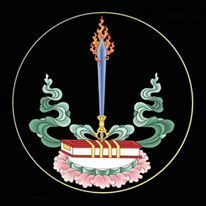 Note: Although not explicitly stated, this text, and its Mantra, is intended to be a condensation or summary of the meaning of the Mañjuśrī-nāma-saṃgīti-tantra (‘jam dpal mtshan brjod). 1 This text features two different “Sanskrit” (or probably Sanskritized) names, in two different published editions of the text, which were both used for this translation. That found in the first version, which describes this as being a condensation of the Mañjuśrī-nāma-saṃgīti, appears to be more accurate. 3 In the first version I used, the Mantra includes the OṂ, while in the second version it does not (however its inclusion does make sense based on the similarity to Mañjuśrī‘s main Mantra, OṂ A RA PA CA NA DHĪḤ. Also, in the first version, TE is apparently written as DA.